On the astrology of Neuschwanstein Castle. Astrology, architecture, art, fairy tales & tourist attractions: an analysis of the astrogeographical positions and astrological data of one of Europe`s most famous tourist sites that lies outside of a major city. Neuschwanstein Castle is located at the northern foots of the Alps as a post-romantic scenario with a fairy tale make up of medieval german castles which had actually never existed in that style. 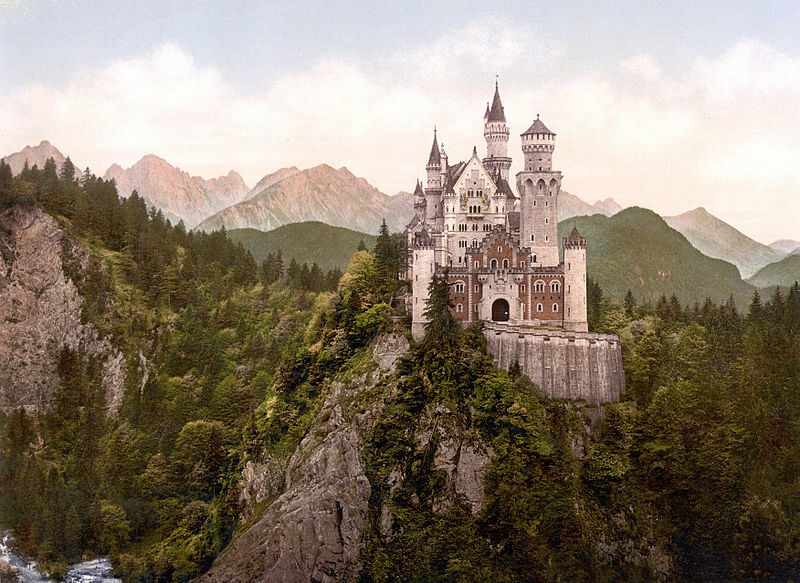 Neuschwanstein may best be understood as a visualization of a fairy tale palace somewhere between Sleeping Beauty`s palace, Rapunzel´s tower and a place for Andersen´s Snow Queen iced on top of the corpus of Wartburg Castle archetype which was used as a prototype. Neuschwanstein sees 1,5 million visitors per year making it probably the most attractive single building in the whole of Germany. Neuschwanstein was built from 1869-1886. Astrogeographic position of Neuschwanstein Castle for morphogenetic field level 4 (exact position) which describes the atmosphere and energetical topics of the building itself: the west wing is located in solid fixed earth sign Taurus the sign of profitability, market places, possession of territory, grounding and growing roots, The central tract and east wing lies in practical, neutral, playful air sign Gemini sign of signposts, symbols, technology, information, curiosity, pubercy and going to ways. Gemini relates to the experiments with new technologies used in the construction. The coordinate for the astrogeographical latitude has the whole of the castle in highly magnetic, self-centered, royal fire sign Leo the sign of the sun, light, self-esteem, luxury, kings, royalty , sexuality and the right for emotional self-expression. Astrogeographic position of Neuschwanstein Castle for morphogenetic field level 3 which decribes how the whole of the Neuschwanstein project area is embedded in the land: one coordinate lies in highly alert, defensive, solid, fixed water sign Scorpio to be seen as the factor that resonates with the fortress character of the castles´s position and the way it towers over the entrances into the canyons that lead up to the Alpine peak to the south of the building. Scorpio is the resonating factor of sculpting and as a highly important practical factor in all arts. It plays the most important role in the arts and alchemy of the transformation of perceived or conceived visualizations into images wether it is through drawings or paintings, wooden, rock or metal figurines and statues, photography and prints, steel enforced concrete or any other way of construction. In photography Scorpio relates to the “fixer bath” which stabilizes an image onto the photographic paper. 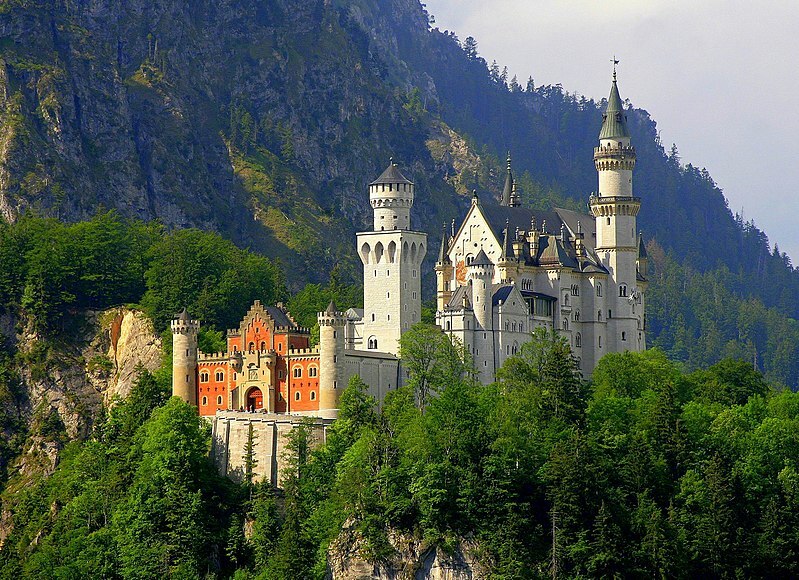 These qualities of Scorpio stand for the exemplary function of Neuschwanstein which has been copied extensively in the Disney versions of german fairy tales and in the Cinderella and Sleeping Beauty Castles. The 2nd coorinate of the Neuschwanstein Caszle project area lies in self-protective earth sign Virgo which serves as the resonating factor of the remoteness atmosphere of the castle and difficult to access and easy to defend strategical location. The location supports the untouchability and virginity image of the castle which helped support the association with the fairy-tale princesses of obstacles. Construction of Neuschwanstein Castle was begun with the laying of the foundation stone on 5 September 1869 with the Sun and Moon conjunct the Virgo coordinate of the larger project area (field level 3) of Neuschwanstein. And exactly while Mars the planet of action entered into the sign of Scorpio the second astrogeographical resonator of larger area in which the construction site is embedded. 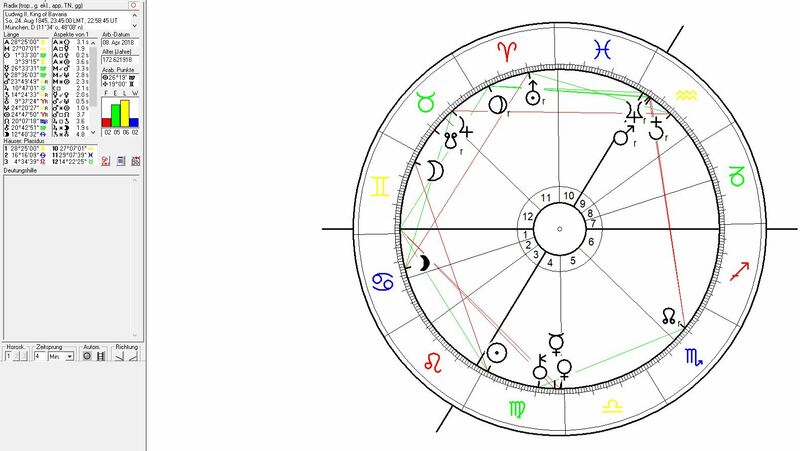 The fact that the moon was exactly conjunct the sun position in King Ludwig´s birth chart shows that the king himself was in the center of the project. How much that was the case can be seen from the fact that the moon was so shortly before new moon that no stimulation for progress for the project itself came from that waning moon position. This leads me to the conclusion that the intense resonance between the king and the construction area was the strongest and simply natural motor behind the start of the project. 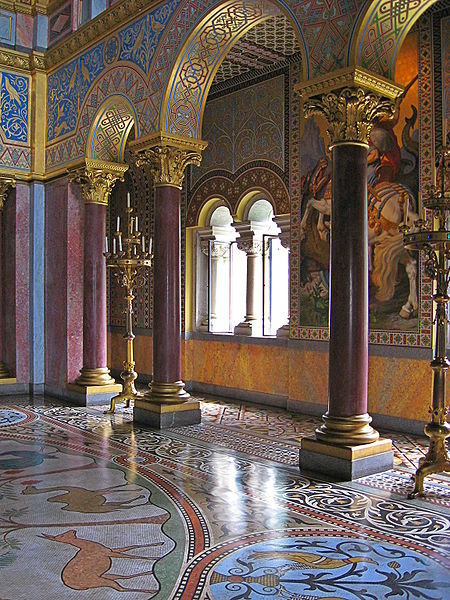 King Ludwig II himself represented the princess of abstacles and Cinderella archetype here. Psychologically the Cinderella syndrome with Kings relates to the fact that the political, spiritual, social role pattern projected onto their personality allows right fo an indivdual emotionality as every single aspect of their lives appears to fall under the pressure of living up to the fullfillment of that role. This “Sissy” syndrome is reflected in the king`s homosexuality – a central aspect of his identity which he wasn´t allowed to live. The whole of the territorial and architectural field of the Neuschwanstein Castle project can so be understood as a simile and an architectural embodiment of the king´s personal emotionality. 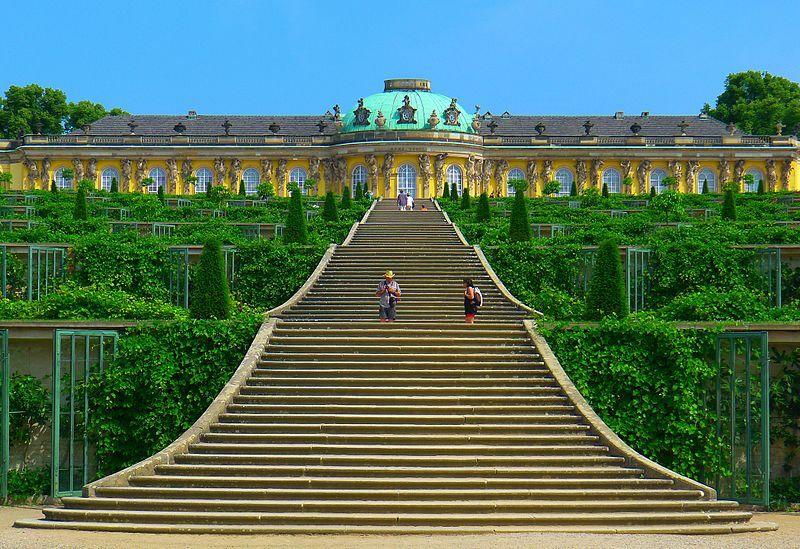 In the history of german palace architecture another famous palace in that line of inheritance is the 2nd most important german palace in regard to tourist attractivity Sanssouci Palace built between 1745 and 1747 by King Frederick the Great of Prussia. Astrogeograpic position of Sanssouci Palace for morphogenetic field level 4 which describes the atmosphere and energetical topics of the building itself: both coordinate are located in dynamic, male fire sign Aries sign of action, speed, warfare, unicellular organisms, yellow colours and indicator for the one-dimensional structural concept of the building. 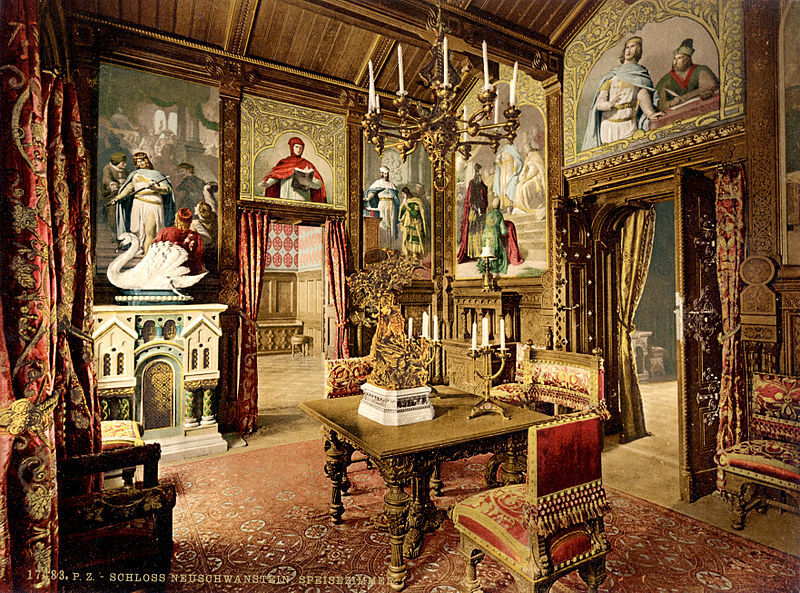 The Virgo coorinate of the construction grounds of Neuschwanstein castle fell in house 4 of King Ludwig II`s birth chart. House 4 relates to emotional individuality, the interior and feeling at home. This resonance clearly suggets that Neuschwanstein provides the energetical stimulation for serving as the king`s personal home and a site of emotional identification and retreat. 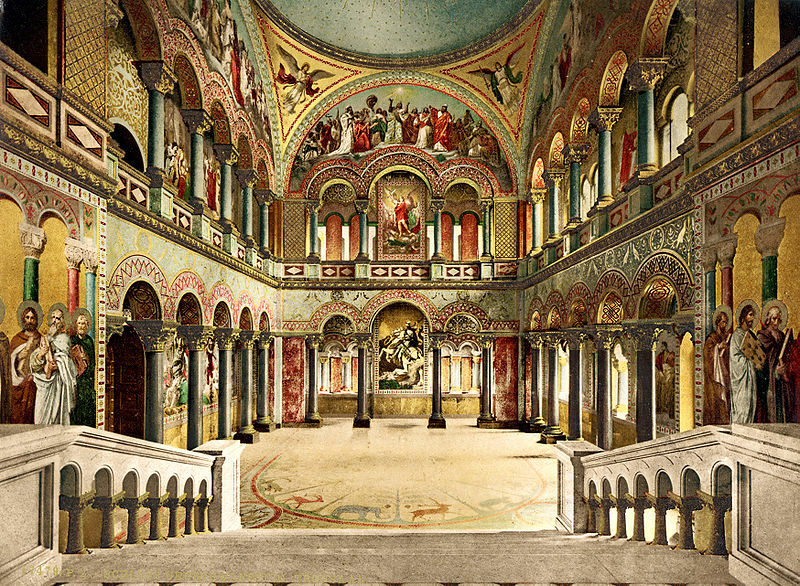 The astrogeographical coordinates of the central seat of the House of Wittelsbach at the Munich Residenz between Libra and Scorpio and in Aquarius combined the resonance of houses 5 and 9 – a highly royal, self-centered and expansive overall constellation in Ludwig II`s birth chart. Despite the historical evidence that the king felt highly depressed, bored and personally rejected at his royal court this astrogeographical resonance relates to the highly stimulative effects long-term effects that Ludwig´s reign from 1864 to 1886 had for Bavaria in regard to its flourishing tourism industries. The combination of houses 5 (emotional pleasures) and 9 (travelling) seems to directly resonate with this long-term effect. Astrogeograpic position of the Munich Residenz palace and castle for morphogenetic field level 3 which describes the atmosphere and energetical topics of the building itself: the Munich Residenz palace and castle is located right on the divide between aristocratic, courtly air sign Libra sign of harmony, balance, justice, symmetry, beauty, decoration and highly alert, defensive water sign Scorpio the sign of fortresses, dungeons, bunkers and self-defense. The west half lies in Libra and the east half in Scorpio. The 2nd coordinate lies in creative, innovative, spiritual air sign Aquarius sign of the sky, heaven, self-finding, innovation, abstraction and indicator for the resonance with the traditional light-blue colour in the bavarian court of arms. 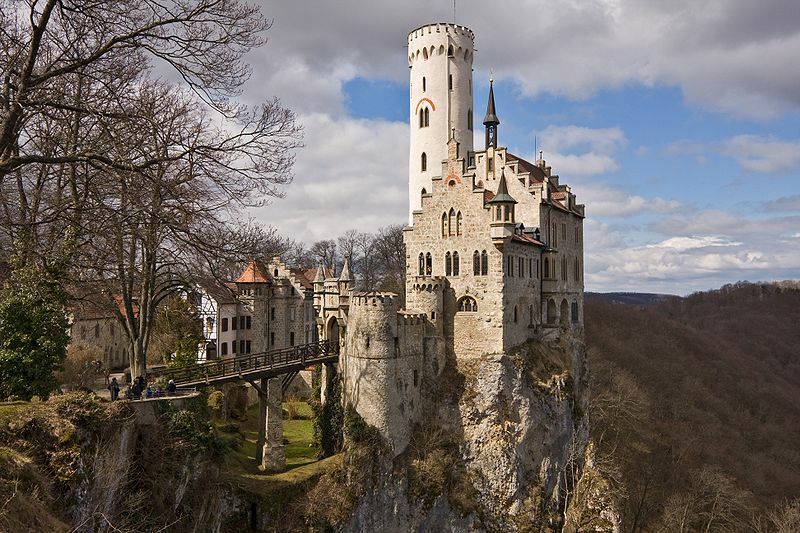 The small but iconic Lichtenstein Castle project built in Gothic Revival style between 1840-1842 for Duke Wilhelm of Urach (born 6 July 1810) was the tirst veritable fairy tale castle . It was inspired by Wilhelm Hauff`s (born 29 Nov 1802) novel Lichtenstein (1826), Recommended: Hauff’s Fairy Tales . Astrogeograpic position of Lichtenstein Castle for morphogenetic field level 4 which describes the atmosphere and energetical topics of the building itself: the coodinate in aristocratic, courtly, female air sign Libra the sign of harmony, balance, beauty, decoration and naive painting stands for the purpose of designig an idealization of a romantic castle. As the sign of openness Libra does not relate to the fortress like, defensive image of the way the castle is placed on the rock at all. The 2nd coordinate is located in self-protective water sign Cancer the sign of the moon, feeling at home, motherhood and crabs. The position in Cancer suggests the association of the castle clinging to the rock here just like the crab archetype does in strong currents or stormy weather. 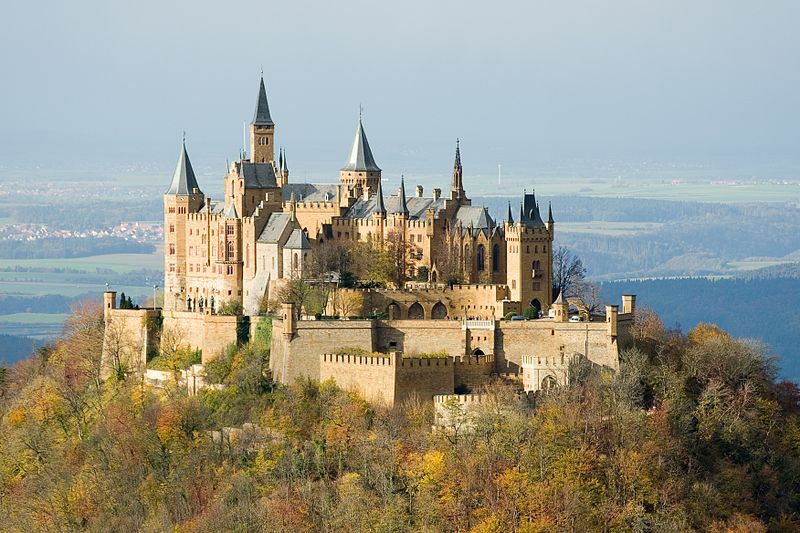 Today`s version of Hohenzollern Castle was built as a new representative castle on the grounds of the ancestral seats of the House of Hohenzollern the kings of Prussia, which were soon to become the german emperors. The hilltop castle is located on Mount Hohenzollern only 23 km south-east of Lichtenstein Castle. It was inaugurated on 3 October 1867 with the sun in Libra. The importance of the historical image of the Wartburg archetype for the prussian and bavarian “head castles” wasn´t through its architectural design in the first place. 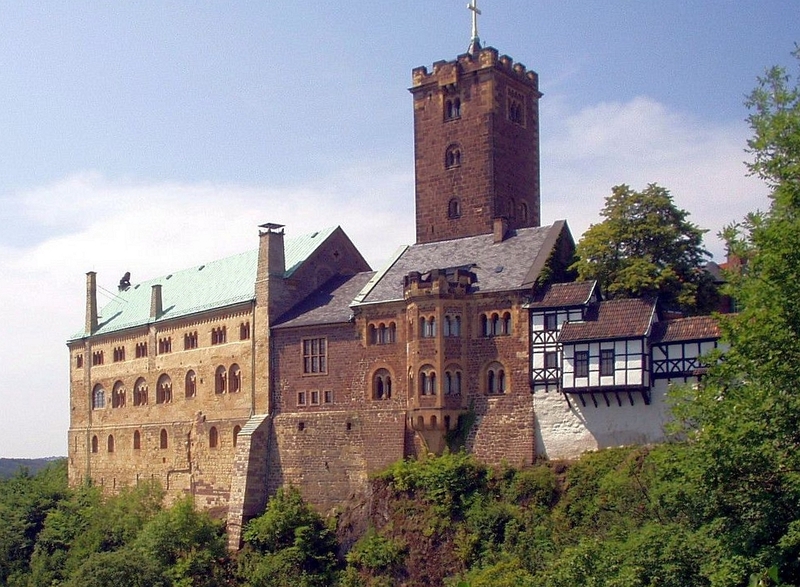 In fact it`s importance lay in the historical role of the Wartburg. Tradittionally it is related to the roots of the german “nation” as the place where Luther was kept safe from the roman church and the Holy Roman Emperor on his way back from the Diet of Worms. This historical back ground played a major role when the French Revolution and Napoleon era destroyed the multinational Holy Roman Empire and along with it the aristocratic system. The First Wartburg Fest celebrated for the 300th anniversary of proclamation of Martin Luther thesis on 18 Oct 1817 gave birth to the german nationalist student movement wthat started the politisal birth period of the german national state which was founded as late as 1871. In that line of development Lichtenstein Castle (1842), Hohenzollern Castle in 1867 and Neuschwanstein Castle has to be understood as a building built to romanticise german nationalism. 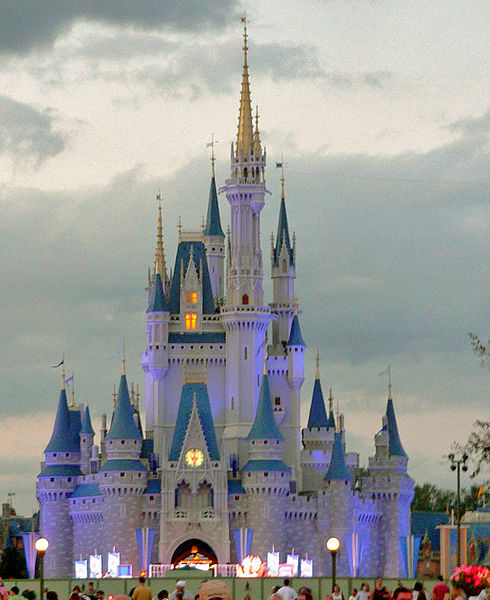 Cinderella`s Castle is the main attraction of the central square in the “Magic Kingdom” which is one of 4 theme parks in Florida`s Disney World near Orlando. Astrogeograpic position of Cinderella`s Castle for morphogenetic field level 4 which describes the atmosphere and energetical topics of the building itself: Cinderella`s Castle is located in the mystic, imaginative water sign Pisces the sign of the dream world in the sense of the Disney Theatre and also in regard to Cinderella`s situation of living in a world of unfulfilled dreams. The second coordinate is in the earth sign Taurus the main indicator for town centres and market places. Taurus so stands for grounding the sphere of dreams and illusions (world of Pisces) here. 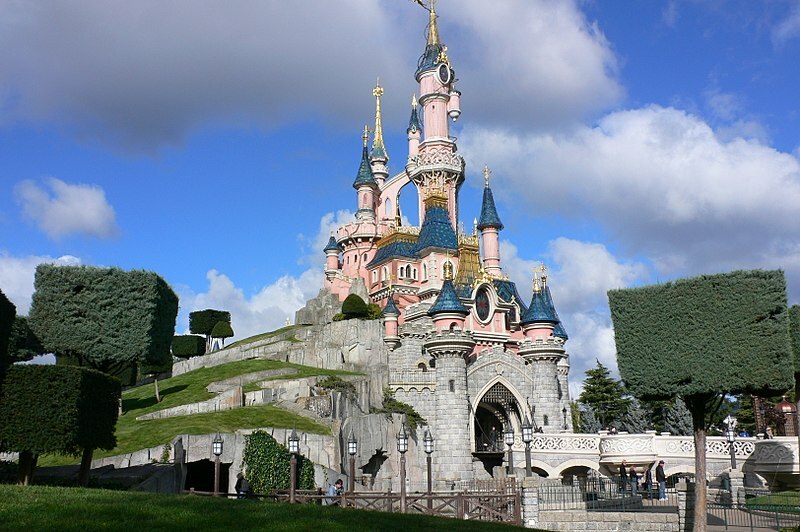 Cinderellas Castle in Florida`s Disney World and Sleeping Beauty`s Castle in Paris look very much the same. The astrogeographic constellation are slightly different. This difference is between the two earth signs Taurus and Capricorn. While Cinderella`s topic is that her birth rights are denied and she`s not allowed in the center of society (Pisces-Taurus constellation) Sleeping Beautys problem lies in her isolation (Pisces-Capricorn constellation). Astrogeograpic position of Sleeping Beauty`s Castle in Paris for morphogenetic field level 4 which describes the atmosphere and energetical topics of the building itself: the castle is located in highly imaginative water sign Pisces the sign of the unconscious and invisible, of intoxication and drugs and of mystification and illusion. This is how Pisces is the indicator here of a fairy tale motive as such as well as of Sleeping Beauty`s deep coma psychological (psychosomatic) issues here. 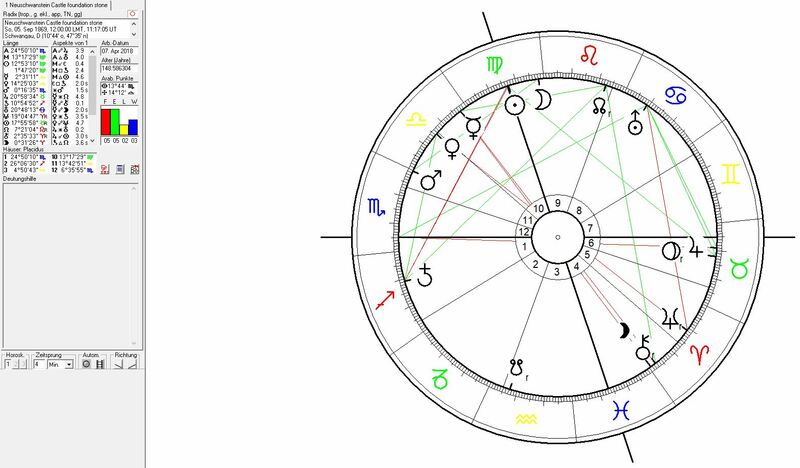 The 2nd coordinate is in highly defensive, conservative, solid earth sign Capricorn the sign of mountains, rocks and indicator for the motive of the thorns (sign of walls, impediments, control and obstacles) that prevent potential lovers from entering Sleeping Beauty`s house. The astrogeographic coordinate in Capricorn also resonates with the elevated position on a small mountain fortress. Neuschwanstein is a climax of the depiction and idealization of the topics of the era of Romanticism which had long surpassed its peak (1800-1850) at the times of the creation of the orgiastic interior of Neuschwanstein`s indulging itself in copies of an imagined medieval otherworld and the decorativity of an ornamentalism that seeks to fill any smallest spaces with the iconography of the “far away idols” as if in an attempt to drive out present times. For an understanding of the astrogeographical resonance factors of the overall concept of the extremely rich artistic work that fills Neuschwanstein`s west wing with the king`s own rooms the astrogeographical positions for the exact adress (field level 4) should be examined. The astrogeographical coordinate in self-centered, royal fire sign Leo is reflected in the fact that the topic of royality was chosen as the central issue of the castle`s main room. All the cosmic allusions like the dome that connects the interior with the image of heaven and thr skies, Jesus and the heavenly trinity. the apostles, saints, angels, wise men and heroes as well as the circle of the animal kingdom painted on the ground serve to explain the suggestion that the king of Bavaria is the natural representative of the reconnection between earth, the heavens and the cultural and spiritual inheritance. The neo-absolutism of this post-romanticist centralism can be understood as an expression of the position in the two major indicators for centralism and gravitation: Leo and Taurus. Taurus stands for the hype for hoarding the available images of times past for the purpose of control over the memory like a territory. In fact romanticism is itself exploited, transformed and destroyed through this hype of collecting icons of depicted personal under the disguise of mystification. The romantic ideal of purification through the reconnection with nature is wiped out through such hyper-ornamentalism which is so typical also for the stage of decline and destruction of the original and essence as can be observed also in later chinese and islamic ornamentalism. The mixture of wooden furniture hand-made by the skillfull bavarian carpenters and wood carvers delivers a certain feeling of being grounded in Bavaria. This aspect especially in earth sign Taurus the sign of rural agricultural backgrounds strongly contradicts the otherworldly cultural inheritance depicted in the finely and nicely worked out mural collections creating a rare alienation effect through the uncomfortableness forces onto visitors by the disregard of the disharmonious effects from that. In the polarity of the square signs Taurus and Leo the motifs gathered from the iconographic hunt in supraregional cultural knowledge fire sign Leo seems to compete with the bavarian homeliness here. And in such a way that both of them loose more than they could win from each other. For astrological comsiderations these are really fascinating insight into the competition between the two elements to be observed here.